The subterranean stream Punkva is a component of the Moravian karst area, the most valuable karst area in the Czech Republic. The connection between the karst areas above ground and the karst areas below ground is most important. This particular karst area is influenced by a number of sinkholes, subterranean tributaries of the Punkva stream connected to caves – permanent or periodical, and a number of springs and surface streams strongly affected by the karst hydrology. Caves generally support typical fauna. In the region of the subterranean stream Punkva, these are only invertebrates, mainly mites and springtails. Several species are newly described to science, some of them are probably endemics (found in the Amateur Cave only). Springs form where subterranean streams come to the surface of the karst area; such stream waters are largely influenced by underground conditions. The RS Punkva subterranean stream covers a part of the karst area that is connected to the Punkva stream, including an area above sinkholes, the subterranean stream itself, and an area lying below springs. It includes two karstic canyons – Suchý and Pustý žleb (dry valley) with many entrances into caves (in Pustý žleb alone there are about 500 cave entrances). Most of the caves are short, some tens of them are of significant importance. The site further includes a karst plane with a sink depression, and terrain above the Amateur Cave complex near to Ostrov u Macochy. In this area there are a number of sinkholes connected to underground karst, often connected to large cave complexes. The bedrock is Devonian limestone (age about 360–380 million years). In the dry valleys, appear inversions of vegetation zones, and so numerous sub-montane and montane species of flora and fauna occur here. Most of the site is forested, only a small area is covered by agricultural land. The underground site itself includes permanent subterranean streams flowing through caves, connected, in places, with pools, periodical streams (so-called flood passage ways), and dry passages with no streams which, however, have a permanently high humidity of about 96 %. In the vicinity of sinkholes, an interesting feature is the drying out of the stream prior to reaching the sinkhole. In the area of springs and further downstream, water quality and hydrology is influenced by its flow through the caves. Summer water temperatures are markedly lower, whilst winter temperatures are higher, the water being well-oxygenated and very hard. These waters support typical communities of springs and brooks. The caves are characterized by peculiar or extreme conditions for life, such as lack of light (green plants are therefore absent), low temperature fluctuations (temperatures usually range between 6 -10°C), extremely high humidity in many caves (up to 100%); these conditions are to some degree influenced by cave size. When compared to southern European karst areas, the caves of the Punkva subterranean stream are relatively poor in species. This is, most likely, caused by die off of many cave species during glaciation. The whole locality is a part of the Protected Landscape Area (PLA) Moravian karst (CHKO Moravský kras), the Ramsar site belonging mainly to the Zone I (core area) and II of the PLA. Almost one third of the proposed site has also been designated the National Nature Reserve Punkva Springs (NPR Vývěry Punkvy); a smaller area is part of the Nature Reserves (NR) Sloupsko-šošůvské Caves (PR Sloupskošošůvské jeskyně), NR Balcarova Rock (PR Balcarova skála) and NR White Water (PR Bílá voda). All four reserves are mainly forested areas. As far as agriculture land is concerned, the territory includes mainly meadows and pastures; in some cases arable land has also been included (providing that cave complexes lie directly beneath it). A specific use of these caves is for speleotherapeutical purposes. Agriculture and forestry is limited in this area by the conditions of nature protection. A major problem is the discharge of untreated wastewater (from the villages of Šošůvka, Vilémovice, Vavřinec and Veselice), and poorly-treated wastewater (from the settlements of Ostrov and Sloup) that eventually reach the underground karst area. Further pollution comes from agriculture. Some impact is caused by tourism and cave exploration. Some improvements have been noted as a result of installation of wastewater treatment plants in the areas above sinkholes, changes in agricultural practices, regulations imposed in those caves with public access, and by setting up conditions for cave research (and exploration). The hydrography and hydrology of the site differ substantially from those of the surrounding area. Streams originating in non-karst area of Drahanská Uplands sink below the ground immediately after entering the limestone area. Hydrography and hydrology of the area is rather complicated - some sinks and springs function depending on the water dynamics, subterranean streams cross each other at differing levels, a sink may become a spring and vice versa, etc. Surface streams are almost non-existent, subterranean streams and their catchments do not correspond with the surface relief. In the area of sinkholes, valleys with abrupt dead-ends, or partially so, have been created and streams are periodical. This karst area has its own, mainly subterranean, hydrographic systems with single erosion base being the drainage system of the Punkva stream. Detailed hydrology of the area is highly complicated and not yet fully understood. Sloupský potok and Bílá voda streams are the sources for the Punkva stream that has a catchment area of 170 km2 and average discharge of 0.96 m3.s-1. Before reaching a cave, the waters of Sloupský stream, during the period of low water level, disappear down about 20 sinkholes or infiltrate into the bottom substrate at the time of low water discharge. Thus, part of the stream is periodical. The stream disappears finally underground at Staré skály (rocks) near Sloupsko-šošůvské Caves. At a depth of 70-100 m it creates the Sloupský corridor that belongs to the Amateur Cave complex. The stream Bílá voda disappears down sinkholes at Nová Rasovna. As in the case of the sinkholes of Sloupský stream, the Bílá voda stream may also dry out as a result of water infiltration before reaching the sinkholes (for some hundreds of metres). The water further continues through the caves of Piková Dáma, Spirálka and others. During the flood periods, the water may also disappear into the cave Stará Rasovna (so-called flood sinkhole). After the water runs through the Holštejn part of the Amateur Cave complex, the Punkva stream is created at the confluence of the Bílá voda and Sloupský streams. The Punkva stream then flows through mostly unknown beds to the Macocha chasm, and through the Punkva Caves to the place where it emerges at the ground surface.The vast majority of the Amateur Cave complex consists of passageways, about 34 km in length, that are flooded only at the time of flood events. The Amateur Cave complex is connected with several small streams that disappear down sinkholes at Plánivy, Jedle, Vavřinec, Suchdol, etc. The area of the Amateur Cave is marked on the surface by a row of sinkholes, such as Cigánský závrt, Měšiny, Dolina, Městikáď, Hluboký and others. The cave Kůlna has archaeological value as the oldest settlement in the Moravian karst area which has been documented (110,000 years old). Also important are the ruins of two castles Holštejn and Blansek. A wind mill in the village of Ostrov has been designated a cultural monument. In the surroundings of Sloup and Holštejn villages are numerous climbing terrains. Four caves and the Macocha chasm are accessible to the public. Almost half of the forested area is located within nature reserves, meaning that these forests will have limited commercial use. Agricultural land is in Zones I and II of nature protection (Zone 1 represents core zone of highest conservation value) and requires only extensive farm management. The following description is focused on the karst area underground (not on the flora of the surface, with the exception of associated surface areas around sinkholes and springs). Red alga Batrachospermum moniliforme is found at the Small Spring (Malý vývěr) area, very abundant is also the aquatic moss Fontinalis antipyretika. The following description is focused on the karst area underground (not on the fauna of the surface, with the exception of associated surface areas around sinkholes and springs). Through continuous specialization, the evolution of cave fauna follows the evolutionary line from trogloxens to troglophils and troglobionts (true cave animal species), including a large number of transitional forms. Troglobionts are of a relict character. The most important locality with regards to fauna is the Amateur Cave (Amatérská jeskyně). Several species new to science have been found here – springtails Onychiurus rauseri and Arropalites ruseki, and the beetle Lesteva absoloni. The true cave species are mainly from amongst the mites: Belba clavigera, Geholapsis mandibularis, Oribellopsis cavatica, Parasitus spelaeus, Rhagidia spelaea, R. wolmsdorfensis, and the springtails: Arrhopalites bifidus, A. pygmaeus, A. ruseki, Folsomia multiseta spelea, Onychiurus pseudosibiricus, O. rauser, O. schoetti, Schaefferia emucronata, Tullbergia jypygiformis. From amongst the troglophilous species: the mite Rhagidia reflexa, the spider Meta menardi, the springtail Anurida grahnaria, Folsomia candida, F. litsteri, Heteromurus nitidus, Onychiurus sibiricus, O. sibiricus, Tullbergia krausbaueri, and the beetle Trechoblemus micros. Of the vertebrates, only bats are important; there are 18 species of bats overwintering in the caves, two species are dependant on wetland areas: the relatively abundant Daubenton’s bat Myotis daubentoni and the rare Pond bat Myotis dasycneme. Communities of the Macocha Gorge are typical for transitional biotopes between cave (underground) and non-cave (surface) biotopes. There is a number of mountain species of Carpathian origin. Typical are the springtails Onychiurus granulosus, Tetrodontophora bielanensis, Folsonia quadrioculata and the cave species F. litsteri (troglophil), and the molluscs: Alinda biplicata, Ena montana, Vitrea transylvanica and Semilimax semilimax. From among the beetles, the most common are Staphylinidae: Chilopora longitarsis, Geodrumicus nigrita, Ocalea rivularis, Philonthus decorus, Quentus mesomelinus, Syntomium aeneum. From among aquatic species, mentioned should be made of an endemic species of the Moravian karst area, earthworm Bythonomus absoloni, from among crustaceans amphipod Niphargus tatrensis, among molluscs Bythinella austriaca and Ancylus fluviatilis. In the Macocha Gorge an important vacular species is found, the critically-endangered Cortusa matthioli ssp. moravica. The fauna of subterranean karst waters is not specific, but found generally in subterranean waters. The true animals of subterranean waters are described as stygobionts. Among crustaceans were found the following species: Acanthocyclops cf. kiefferi, A. languidus v. belgicus, A. languidus v. deminutus, Echinocamptus echinatus while the most striking is Niphargus tatrensis. Troglophilous crustaceans are: Candona eremita, Acanthocyclops languidoides, and Paracamptus schmeili. In spring areas of caves, but also at the bottom of the Macocha Gorge, are found the molluscs: Bythinella austriaca and Ancylus fluviatilis. Typical dwellers of springs include the mollusc Bythinella austriaca, mayfly nymph Torleya belgica, stonefly Amphinemura triangularis, and from among the caddisfly genus Rhyacophyla. Also found was a chironomid Syndiamesa branichii (mountain species). Karst streams in the area of springs are characterised by high hardness of water, high fluctuations in water flow, summer drying, and low temperatures with relatively high-oxygen levels. The most abundant benthic species are Gamarus fossarum and Baëtis rhodani. Typical are species characteristic of sub-mountain to mountain brooks and streams (mayfly nymphs Baëtis alpinus, B. lutkeri, Ecdyonurus venosus, stonefly nymph – Leuctra albida, caddisfly Philopotamus montanus, black-fly Odagmia monticola among others). The most important fish species found in stream spring areas is Cottus gobio. The Agency for Landscape Conservation provides measurements of microclimatic conditions inside caves and evaluates the impact of visitors (focused on Punkevní jeskyně Caves). An assessment of saprobiological conditions upstream of sinkholes and downstream of springs, and a study of algal populations in the Punkva stream below spring (both diploma work at Masaryk University, Brno), and also research and mapping of caves (Czech Speleological Society). 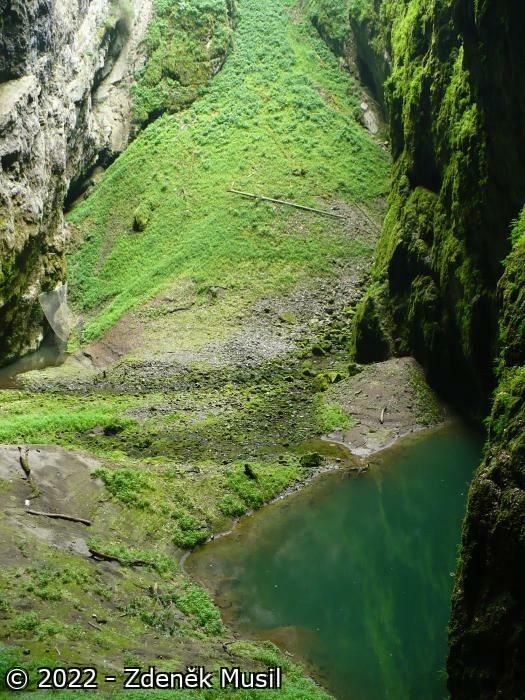 The Ramsar site is the most visited part of the Moravian karst area, there being four caves (Punkevní, Balcarka, Kateřinská and Sloupsko-šošůvské), and the gorge Macocha (propast Macocha) open to the public. The Punkva Cave is visited by over 250,000 visitors every year (mainly in summer months). The Punkva Cave, in contrast to the other three named above which are closed to visitors during the three winter months, is open throughout the whole year.